NVIDIA's business enjoyed a transformative year in 2016, but one division's triple-digit expansion makes it the best segment within the GPU specialist. Stocks simply don't get much hotter than shares of NVIDIA (NASDAQ:NVDA). The graphics semiconductor specialist's stock rose a truly incredible 224% in 2016, easily making it one of the best-performing tech stocks of 2016. Almost by accident -- NVIDIA struggled for years to break into mobile -- NVIDIA's graphics processing chips (GPUs) lie at the heart of several truly transformative industries. As such, NVIDIA's powerful performance stemmed from widespread success across the company's newly created structure around five of its largest markets. As a matter of semantics, NVIDIA only maintains two official reporting segments -- GPU and Tegra -- that focus on the two main types of processors it produces. 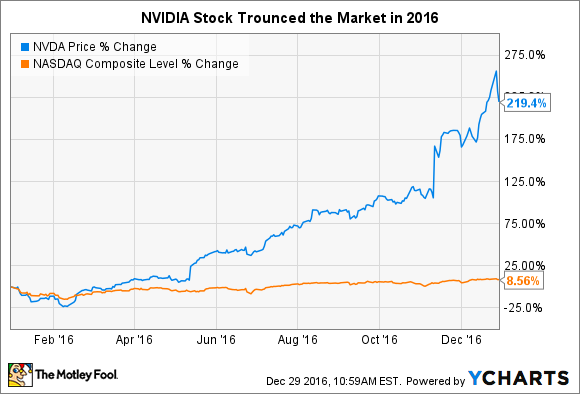 However, NVIDIA also recently began breaking out its operating results by the various specialized markets to which it caters, which is far more useful for investors trying to understand its underlying growth drivers. As such, I'll examine NVIDIA's business through the lens of its new markets-based reporting categories for the purposes of this analysis. Here's a quick snapshot of how NVIDIA's five market segments performed in the three reported quarters from 2016. Data source: NVIDIA Investor Relations. Since NVIDIA's business performed so well across the board this year, several of its markets segments could qualify as its best-performing segment. However, its impressive triple-digit growth makes NVIDIA's Data Center business its best-performing segment in 2016. And as its impressive expansion certainly suggests, this segment's growth could just be starting. NVIDIA's data center group truly came of age in 2016. Once a relative niche that catered largely to the supercomputing market, NVIDIA has managed to broaden its addressable market by expanding the possible applications to which its Tesla computing platform could cater, particularly in machine learning and artificial intelligence applications. The image-intensive nature of AI computing -- such as distinguishing cancer cells from a cluster of health cells in a CAT scan -- requires massive amounts of graphics processing power that only NVIDIA is truly equipped to provide. In fact, NVIDIA's 2016 Investor Day presentation cited at least 12 industries including higher education, healthcare, finance, manufacturing, cloud computing, and many more that all use NVIDIA's GPUs to meet their burgeoning image processing needs. The company recently said it believes the market for its data center chips represents a $5 billion opportunity, giving it ample room to continue to grow into the medium term. Importantly, its booming data center business is just one aspect of NVIDIA's enviable growth outlook. The company's graphics processors also help power coming next-generation technologies including self-driving cars and virtual reality in addition to its artificial intelligence applications. Estimates as to the exact growth potential of each market should be taken with a grain of salt, but analysts predict 10 million self-driving cars could be on the road by 2020, a number that could reach 21 million by 2035. Similarly, another well-respected research company believes shipments of virtual reality hardware will exceed 64 million by the start of the next decade. Lastly, it also bears noting that NVIDIA's growth certainly doesn't come cheaply. Its shares trade at 70 times its trailing-12-month earnings per share and 40 times next year's estimated EPS. For context, the S&P 500 currently trades at 25 times its current EPS. At the same time, Bank of America estimates call for NVIDIA's sales, profits, and free cash flow to all double by 2019, a point at which growth markets like self-driving cars should still be in their infancy. Patience is a virtue in investing, and those willing to wait for the gains from NVIDIA's impressive upside to add up should be rewarded over the long term.